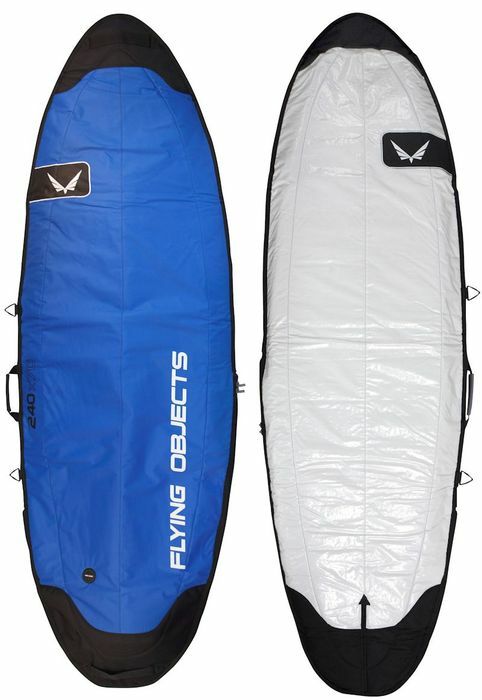 3.5	stars -	"Review for Flying Objects Windsurf Day Cover" Mark Taylor This Flying Objects Windsurf Day Cover is the best Bags and Covers I have tried. Based on the travel cover patterns we have developed the board bag as a price point alternative. Using 600D polyester for the top and a reflective white tarpee for the bottom, the board bag provides extra heat deflection. Padded to a total thickness of 6mm the board bag is lighter in weight & has additional attachment points for a shoulder strap. Measurements based on the board that will fit ie a board measuring 235 x 60 will fit in the 235 x 60 cover. If in doubt call us with the board brand/model etc and we can advise best fit.